Questions about Repose Gray SW 7015? Please leave a comment below! I just got samples of Agreeable Gray and Repose Gray. I was surprised to see how dark they both seem! We more samples made at 50%, but I’m not sure I like them. I guess I’ll try 75% or is there another light warm gray from Sherwin Williams you recommend? Agreeable almost has a purplish tint to it in my house?? Yes, paint colors can definitely look very different on walls compared to the paint swatch. I always recommend putting up samples! Worldy Gray might be another light gray to try. Also, keep in mind that you are looking at small sample and once it is up on all of the walls it will probably look lighter (especially after it is totally dry). But, if Agreeable Gray looked purplish in your lighting, then maybe trying another light gray would be best! Let me know if I can Color Consultation in more detail and what you decide. Thank you! Thanks Laura! We decided on Agreeable Gray at 100%. Yes it definitely looked lighter once it was on the wall! So my next question is what color would you suggest for a charcoal or navy accent wall or what is another dark color you would suggest? I’m hoping to use lime green, navy and hot pink accents through out as a bright splash of color. I’m so glad that Agreeable Gray worked out for you! Yay! Try Dovetail, Gauntlet Gray or Anonymous for a charcoal color. Black Fox as an accent color for one wall could be a really dramatic contrast with your lime green and hot pink pops of color! For navy, my favorites are: Naval and Charcoal Blue. Some good dark blue-grays are: Dark Night and Rainstorm. Let me know what you end up deciding on! Such a fun color scheme. Also, if you would like further help, I offer Color Consultation. Thanks for reaching out! I keep going back and forth between Repose Gray and Anew Gray to go throughout the open living room/dining room of my new apartment and then into the kitchen! The apartment has southern facing widows and mid century style parquet flooring. I will not, unfortunately, have the opportunity to put samples on the walls. I’ve decided on Sea Salt for the bathroom and also debating b/w Exclusive Plum, Midnight and Stunning Shade for the bedroom. Would love to hear your opinion – thank you! Repose Gray and Anew Gray are both great colors! From my experience, Repose Gray seems to have a hint of a blue undertone to it. Anew Gray is definitely more of a “greige” neutral color. Again, both are gorgeous and it depends on your lighting, etc. I just released a new tool called the “Color Selector” that helps give a starting point for picking paint colors specific for your space. You can check it out HERE! I love that you picked Sea Salt for your bathroom! It is one of my favorites! 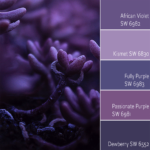 I also like your ideas for Exclusive Plum, Midnight and/or StunningShade for your bedroom. If you would like further help, I also offer Color Consultations in which we schedule a time where I can view your space via Skype or FaceTime. 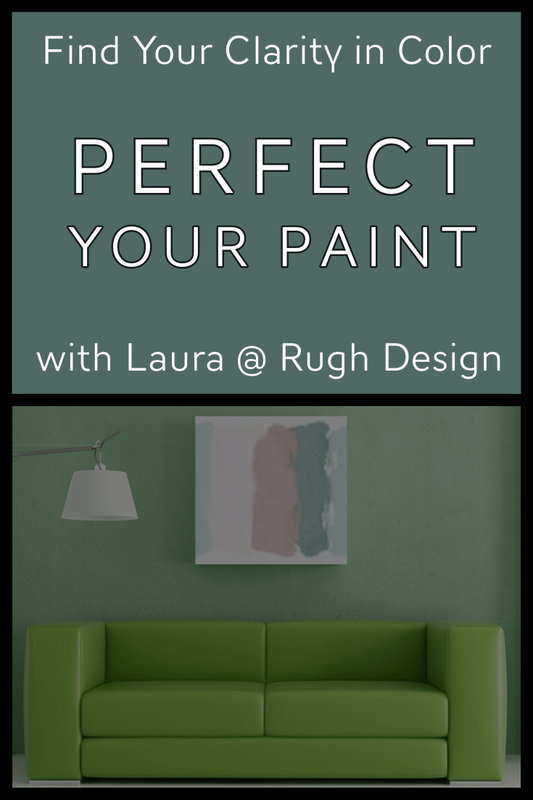 Here is more information if you are interested: Color Consultations by Rugh Design. Thank you so much for reaching out and I hope to hear from you soon! 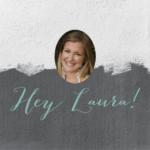 Hi Laura, I love your site, and this blog has been so helpful! Im struggling between Repose and Agreeable Gray as a throughout color from the entryway, kitchen, and living area. The cabinets in the kitchen are a medium wood with slight cherry tones, and the floor is a light brown stained cement. The floors throughout the rest of the house are a medium toned sort- of cherry colored laminent. I really want to make the wood accents in the house pop, and compliment the white trim. The house doesn’t have a ton of natural light, but I wouldn’t say is poorly lit either. I’ve been crazy back and forth between these two, help! Thank you! I’m so happy to help. 🙂 Based on what you told me, I lean towards Repose Gray. It is a little bit cooler than Agreeable Gray and would compliment your warmer stained cabinets and floors as well as pop against your white trim. If you are still having trouble and need further help, please feel free to let me know and we can set up a Color Consultation! Thanks again for reaching out! A few others to try are Repose Gray or Silverpointe. Let me know what you end up deciding! If you are still having trouble, please feel free to contact me for a Color Consultation. I would love to help further! Thank you for reaching out and have a great rest of your week. Does Agreeable gray compliment honey flooring too? I am having the same problem. Matching up a nice trim color has also been a bit difficult against repose or agreeable gray. Any suggestions? I am in quite the gray paint dilemma and hope you can help me quickly. I am re-painting all of the main areas of an open concept house from BM Annapolis Gray because it is way too pinky beige. The only room it looks halfway greige is the livingroom which faces north. Everywhere else with low light it looks tan. I have dark wood trim and dark stained concrete floors. I started to paint the walls SW Repose Gray, but in the low light, it actually looks green. So I tried a cooler gray, Passive, and now it is a little too on the blue side. I ended up painting the TV room off the living room Elsie Gray and with all the natural light in there, it is showing blue as well. Should I just go with the Repose Gray or mix Repose and Passive together? Really confused and the painters are here tomorrow. Thanks in advance for your help. It sounds like you need a warmer greige/gray. I would love to help via a Color Consultation if you are able to post-pone the painters! This is the best way for me to recommend the best color for your space. Let me know what you think! Omg I had the same issue. I started with passive because it looked amazing in my 1/2 bath (all artificial lighting). But completely blue and cool in my living room. So I went with repose and now most of the day it is either green or cementy!!! Help I am going crazy! Thank you for your comment and I am sorry I am late in getting to it. However, it sounds like you are in need of more than I can offer by simply responding here. If you are still in need of help please check out my Interior Color Consultation packages in my shop. I really like your website. There is so much good information! room which will be painted Black Fox SW70200. Can you suggest a color for the game room that could warm it up a bit? The carpeting in the room is a medium dark gray. Thanks for the quick reply. I love the blue-gray idea and am already using it downstairs in the laundry room and master bathroom. I was thinking of something a little warmer for upstairs. What do you think of either Caramelized or Bagel? I like the orangey tones but am not sure if it will go well with the grays. The room has 5 good sized windows and faces northwest. What do you think? A warmer orange-toned color is definitely a complimentary color! Let me know what you decide! Is it okay to mix between the different color schemes? For example, my main level is open concept and I would like to use Repose Gray through the majority of the living space (foyer, living room, dining room).. however, the kitchen is toward the back of the open space and I am leaning towards a color such as Quietude for the kitchen. I am also thinking about Foggy Day above white beadboard in the powder room and laundry room. The stairs head off the living space and I am thinking Agreeable Beige for the stairwell and extending into the upstairs hall. Quietude is a triad color, Agreeable Beige is an analogous color, and Foggy Day is a complementary color. Is it okay to mix between these palettes as you move between rooms in the house? Each color on this page has a relationship to the Repose Gray, correct? That is a great question! Yes, it is okay to mix the different color schemes. I would just be careful to be sure that the undertones go with what you have in that space. Otherwise, it is okay to use colors from a different “scheme.” Agreeable Gray and Repose Gray are similar shades, so be sure that they transition well between each other. If you would like help pulling the colors together in your home, I offer Interior Color Consultation! Let me know if you are interested. I have a question about coordinating colors for repose grey ? I have two accent walls which need to be repainted . Both of the walls do not get a ton of light during the day . Could you recommend a few neutral cordinating colors ? 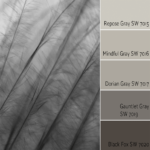 Is the main color of your home Repose Gray? There are tons of options for coordinating colors, but it helps to know what other undertones you have going on in your home like the flooring and accent furniture. I would love to help you find the right color through an Interior Color Consultation. I can view pictures of your home and be able to correctly select the colors that will work in your space. My favorite go-to white to pair with Repose Gray is Extra White. Its the truest “bright white” from SW and it pops out nicely against colors like Repose Gray. Thanks for reaching out and have a great week! We are buying a house and can pick any SW paint we want for the interior. My cabinets will be white and hardwood Jacobean floors. I’ve narrowed my choices to repose gray or agreeable gray and just can’t seem to pick one over the other. Can you provide any help? I like your selections so far! Very classic. I like Repose Gray and Agreeable Gray for your overall colors. Repose Gray tends to have a cooler almost blueish undertone and Agreeable Gray is warmer with more of a beige undertone. It’s really up to you and your style preferences and/or current upholstery selections. If you tend to be more drawn to the warmer greige tones, then I would go with Agreeable Gray. If you like the cooler tones, then Repose Gray would be your best choice. I would love to help you narrow it down through an Interior Color Consultation if you need further help. Thank you so much for reaching out! Hi Laura! I was wondering if you could tell me the difference between Repose Gray and Silverplate? I am not very experienced with choosing paint colors and I am trying to determine if I am able to spot the different tones/underlying colors in all these different shades of gray! Thanks for reaching out! Repose Gray and Silverplate are very similar. Silverplate is a tiny bit darker than Repose Gray and has a bit more of cool undertone than Repose. Both can tend to have a slight blue undertone, Repose Gray is just a tiny warmer. What space are you painting? I would love to help you make the final choice through an Interior Color Consultation if you are interested! Hello I wanted to know what you thought of either repose gray or drift of mist for an exterior paint color. It is a coastal home. Would like to do a white trim and gray shutters. Do you think those would work and if so which one would you prefer. Thanks for reaching out! Repose Gray and Drift of Mist are lighter shades and on an exterior are going to look more washed out and not give you much contrast against the white trim. I would try at least one shade darker than Repose Gray to give some contrast. Let me know if you would like help nailing down the right color through an Exterior Color Consultation. I enjoyed reading the comments and your suggestions. for my dining/kitchen when transitioning from the den? Thank you so much! Well, your dining room color will depend on your existing selections (floors, furniture, accents, etc.). If you have taupe undertones in flooring, then pick up on those tones for the wall color. If you have beige undertones in the flooring, then look for a neutral with more beige undertones, etc. Silverplate is a cooler color, so keep that in mind when selecting a complimentary color. I would love to help you find the perfect color through an Interior Color Consultation if you are interested! Thanks, Angela for reaching out! Thank you for reaching out! Extra White would be totally fine with the Frosty White ceilings. It is a bright “true” white, so if you want to go a bit more off-white, there are a few other good options out there. Let me know if I can help you nail down the perfect color through an Interior Color Consultation! I would be so happy to help. What would be other trim colors in the white family you would suggest with Repose Gray? Dover white? I would look for a trim color that has a cooler undertone or a bright white. Dover White is a bit on the warm side, but test out a sample. Sometimes, you will be surprised! Hi Laura! We live in a small house where it is hard to break from one color to another. I am looking for a cozier greige color (not bright) to do throughout that would look good with honey oak floors, cabinets painted in cape may cobblestone (BM) and another wall that is in Skydive (BM). I am thinking this will be a hard task to accomplish! I do have the turquoise/teal color as accent throughout my living room/kitchen. Thanks for reaching out. I love the aqua accent color! I like your thought of trying Repose Gray. Grab a sample board and see how it looks right up against your cabinets and existing wall colors. I would love to help you nail down the perfect color through an Interior Color Consultation if you would like! thanks. I will try it along with Silverchain which is a lighter version of what is on my cabinets. Sounds good! Keep me posted on what you decide. Hi Laura. I am enjoying your site and reading about all the different colors. We have shaker beige in our hallway and are now painting our dining room which is off the hallway. I have cherry hardwood and a cherry dining room set in there. Next year we will be laying a new floor though in a lighter color – browns and grey mixture. I think I have it narrowed down to two different grays – repose gray or agreeable gray. Do you have an opinion on which one would go better with the floors. There is also wainscoting in the room which I am going to paint extra white. Thanks for any thoughts. Thank you! I’m so glad that my site has been helpful. 🙂 I lean towards Repose Gray since it has a slight blue undertone that will compliment the cherry hardware and dining room set. If your tile selections has more of a gray/brown undertone, then I would go with the Agreeable Gray. The best way to find out is to test a sample on a piece of cardboard and set it up vertically right next to the floor choices. I would love to help you narrow it down through an Interior Color Consultation if you are interested! 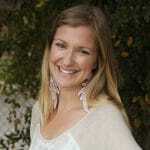 Love your website and your helpful tips! We are building a new house. We went to go see it yesterday since the walls just got painted. Our color scheme is interior walls-repose gray, trim- BM white dove, kitchen cabinets- BM white dove, kitchen island-BM Hale Navy and barn door- Dorian Gray. Wood floors will be light warm white oak and carpet will be Tuftex Serendipity in Cement. Right now the repose gray is pulling into its purple tones in the east facing (lots of light) great room! Yikes! Do you have any suggestions about furniture/accent colors to help the repose gray not go purple? Your home sounds beautiful! I would try to use warmer accents to tone down the purple undertone coming through. Typically, pairing colors with their opposites (or complimentary colors) helps to tone down the strong undertones. Let me know how it turns out! I have chosen repose gray as my overall interior color. What color can you suggest that would add dimension/compliment the Repose Gray? Great! I love Repose Gray. I really like Repose Gray with dark charcoal accents and creams/whites. Let me know if you would like help with selections through an eDesign! That would be a fun project to work on! Thanks so much for reaching out. Hi, I am repainting my great room. Large vaulted ceilings and a lot of windows. I just purchased to beautiful wool rugs with a gray tone. I would like to paint the walls repose gray but am a little concerned because i have pecan hard wood floors and trim. i am wondering if it is too much brown for gray walls. The rugs look great with my off white dining room furniture and sectional. If i did use the repose do you have a ceiling color in mind? Thanks for any help. I think you will be fine with Repose Gray. Your hardwood floor and trim will still work well with it since it is a wood stain and not a painted color (I hope that makes sense)! I typically like white ceilings for a crips and clean look that keeps the space feeling open. Extra White is my go-to! Keep me posted on what you decide with the wall color! I would go with Mindful Gray if you are worried about it getting too dark. Keep me posted on how your paint project goes! Moving into a new apartment next week. I’ve decided on Repose Grey for our main color but wanted to do some accent walls. What would you recommend? We have dark furniture. I haven’t been able to come across a color that might work with Repose Grey for an accent wall. Hi, my wife and I JUST painted our exterior. We have a 1950 ranch block and brick home, with a add-on second floor ( wood siding). We did the first floor in repose, and the second floor in mindful for subtle two – tone to give the house some dimension. The trim is snow bound. However, the contrast between Repose and Mindful is so slight it just looks like and uneven paint job. Is there a color you wold recommend for second floor? We thought Mindful would deliver more greige. I’m so sorry! That is frustrating to have just painted and not be very happy with it. I would go several shades darker than Repose Gray for more contrast on the second floor. Acier or Dovetail would work to give you some more contrast. Let me know if I can help with anything else. Keep me posted on how it goes! I’m in a panic. white cabinet in the kitchen with island cabinets in Repose gray. Also used Repose on the range hood that goes to the ceiling. Owl gray is going on the walls in new construction. Will this be a ‘mess’?! What color walls would you suggest to contrast Repose Gray painted kitchen cabinets? If you have good natural lighting, try going one shade darker than Repose Gray. I also like white walls contrasted against Repose Gray cabinets! I was thinking to paint my whole house with the Repose Gray color. We have white cabinets with grey tiles in the kitchen and dark brown leather couches and ancient hard wood floors in the living room 🙂 . Do you think it would work great and is the color versatile enough? Also what color ceiling/trim would you use with repose gray (in white, from SW)? Can anyone tell me what color carpet I should buy. We just painted entire interior in repose gray. Would love to help you pick out your carpet. Sign up for an A la Carte eDesign and let’s get started! We are currently building a home at Canyon Lake. I have open concept living, dining and kitchen with a breakfast nook. I have been looking at repose gray for this main living area, but I’m a little concerned because I’ve heard some say it can turn a whitish color in certain lighting. I would love to know your thoughts on this. What a fun house project! If you have a lot of natural light, it can wash out the color some. Mindful Gray is one shade darker than Repose Gray. If you can, sample both to see how they look in your lighting. Let me know if I can help further! Repose gray walls. I want to do primary colors; lots of blues, reds, yellows, and white (with some black)-will that work together? It’s either that or agreeable gray. Not sure what will work as we have to paint all the walls the same (for now-can add accent walls as we live there longer). Trim will be white white. Yes, that color combo works together when accented in the right way. Repose Gray has a touch of a blue undertone and Agreeable Gray is a bit warmer (a warm greige). You can go either way depending on your other selections for flooring, etc. Let me know if I can help you find the right color through a Color Consultation! Hi. My daughter has an accent wall of SW Aquarium. Which light gray would best compliment this color? Her furniture and curtains are white, and her comforter has aqua, gray, yellow and white. Thank you. I chose Repose Grey for my living room, I am looking to stay in the greys but need a lighter shade for my foyer and hallway. Any suggestions? It’s a dark space with a lot of wood. Painting a finished basement with not a whole lot of natural light. I love Repose Gray, but it’s showing up darker than I want. I don’t want the space to feel like a cave. Even at 50% strength, it still looks dark. Eider White looks way too light. Can you recommend a gray color that’s somewhere in between? Hi! I painted my family room Repose Gray and love it! Want to paint my kitchen ( which adjoins my family room) a nice color that would compliment the Repose Gray. Cabinets are oak and granite is gray/black/tan. Any suggestions? Hi. We are remodeling a small two bedroom, one bath home. We painted the living room, hall and kitchen Repose Gray. It turned out a bit too cool/blue for my liking (should have gone with agreeable gray) but it’s ok. I don’t know what color to paint the bathroom. I like some pictures of a darker warm gray sort of greige but I’m not sure if this will look right. Should I go with a blue instead? My bedroom turned out too warm/brown. We went with Perfect Greige. You walk into the bathroom from the hall wich, like I said, is Repose Gray. Help!!!!! We live in a split foyer where our living room and kitchen/dining go together. Our living room ceiling collapsed so we are starting fresh….New paint, New flooring, New furniture……this is stressful. Our trim is new and is English chestnut oak (medium color) stained. We plan to do a similar colored floor with some woodgrain for character. I have cherry kitchen cabinets (medium color with reddish orange tint) and a light tile. I can’t decide if we should do Repose gray or agreeable gray. No furniture picked out yet. What should I do for color? In am afraid of picking the wrong color plus what if furniture I pick doesn’t go with it?! I am going to paint the living and entry repose gray. I have one wall that has 2 long floating brown shelves with black framed pictures. I would like to find a complementary color to make this an accent wall. I am thinking some kind of blue? I don’t see any oics online that have a repose gray room with an accent wall. Thoughts? Thank you for your comment. I understand wanting a solid exterior trim color especially on a commercial building where you are selling space for others to use. Your exterior palette might be the first thing that your tenants clients see and might effect how those clients perceive your tenants. Good choice on the Repose Gray however it sounds like you are in need of more than I can offer by responding to your comment. Please check out my Exterior Color Consultation and select the Trim & Accent package in my shop. This was really helpful! Thank you! We are building a new house on the East Coast of Florida east facing front and south facing back, I just picked my exterior colors, Base: Origami White, Trim: Anew Gray, Doors (garage &Front): Sealskin. Trying to pick the main interior color that flows with the outside and gives it an inviting entry, but not too warm or too gray. 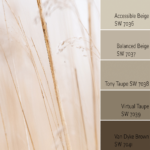 I think I am between Accessible Beige and Agreeable Gray.. but cant decide…. I want to test them both but not sure we will get to depending on the timeline of the build. We are going for a west indies/classic/modern theme, white cabinets, dark island, dark wood flooring and white countertops with a white stone fireplace. What are your thoughts on interior color? I love your exterior color choices! Just for a reference, I consider Accessible Beige a greige/taupe that is warm without being golden and is one of my go to “not too beige, not too gray” interior colors. That being said, after I read your comment, I was leaning towards Agreeable Gray. Agreeable Gray is a bit more gray than Accessible Beige, but is still warm enough to not feel cold and sterile. My new home is actually painted in Agreeable Gray and I love it! Also, since your exterior trim is Anew Gray (one shade darker than Agreeable Gray), it is a perfect color to connect the exterior and interior! Let me know what you end up deciding. All of our interior walls are Repose Gray. I have a small downstairs bathroom that I would like to do in a color that will coordinate. It’s a very small bathroom, just off the kitchen and gets no natural light. No windows. My style is Shabby Chic cottage (we’re in a beach house). Any suggestions? Thank you for reaching out! I would love to help you settle on a color for your bathroom that will coordinate with the Repose Gray in the rest of your home. However, it sounds like you are in need of more than I can offer by responding to your comment. Please check out my Interior Color Consultation packages in my shop. Thank you for your reply to my email. I appreciate it. I have a very open concept home, from living room you can see every room on first floor and upstairs hallway. I am painting most of the rooms in repose but would like some variety. Would mindful gray work in the living and dining rooms which face each other across the foyer. And Serious Gray for the front door?